Doncaster was the cornerstone of the rebuilding of the Eaton Stud near Chester, England. The ancestral seat of the Grosvenor family had been a Thoroughbred stud since the 1780s. By the time Hugh Lupus Grosvenor was created the first Duke of Westminster in 1869, there had not been a really top class breeding program at Eaton since the days of Touchstone and his son, Newminster. The Duke set about searching for a stallion, and looked at, among others, the French wonderhorse, Gladiateur. He, however, was chronically unsound. The Duke required of a stallion prospect an exceptional pedigree, and proven form in the classic races. Doncaster filled that bill admirably. The handsome, blaze-faced chestnut colt had been bred by Sir Tatton Sykes and raised at Sledmere Stud. His pedigree was a typically classic one for the era. Doncaster was sired by Stockwell, known as "The Emperor of Stallions." Stockwell, a son of The Baron out of Pocahantas, had been a classic performer himself, accounting for the Two Thousand Guineas and the St. Leger. During the 1860s, he was a perennial leading sire, and accounted for over a dozen classic winners during his stud career, including Blair Athol, Lord Lyon, Achievement, and St. Albans. The dam of Doncaster was Marigold, daughter of Teddington, a Derby winner. She had been a decent filly on the track, with a second place finish in the Oaks on her resume. Doncaster was bred for the sales, and he went through the Tattersalls auction ring, where he fetched 950 guineas, the purchaser being a Mr. James Merry. Merry was no neophyte to owning good horses, having previously had in his stable King of the Forest, Macgregor, and Marksman, the latter a good colt which finished second to Hermit in the 1867 Derby Stakes. Doncaster had gone through the sale plagued with the moniker All Heart and No Peel. His new owner mercifully gave his colt the much more dignified name of Doncaster, and sent him to be trained by Robert Peck. Doncaster, being a backward colt and also suffering from the effects of a kick in the stifle, did not compete as a juvenile, and in fact, was not seen under colors the first time until the Two Thousand Guineas of 1873. Not surprisingly, he finished unplaced to Gang Forward, another son of Stockwell. From there on, Doncaster developed rather quickly. He captured the Derby in his very next start, in what was described as easy fashion, turning the tables on Gang Forward. Sent to Paris for the Grand Prix, he finished a respectable third. Back home in England, at the course for which he was named, Doncaster, the colt very nearly pulled off a victory in the St. Leger, but was beaten a scant head by stablemate Marie Stuart, the heroine of the Oaks. He was not the same colt the rest of the year. He finished well back of Flageolet in the Grand Duke Michael Stakes, and then a more heartening second in the Newmarket Derby to Kaiser. As a four-year-old, Doncaster deadheated for second with Flageolet in the Ascot Gold Cup, which was won by Boiard, his conqueror in the Grand Prix. Doncaster then won the Goodwood Cup. At five, in the space of two days, Doncaster captured the Ascot Gold Cup and the Alexandra Plate. Retired after the latter victory, trainer Peck purchased the horse for £10,000. Since at the time Peck was also the trainer for the Duke of Westminster's stable, he was well aware of the Duke's search for a decent stallion prospect. In a clever business coup, Peck promptly sold Doncaster to the Duke for £14,000. Installed in the stallion boxes at Eaton, Doncaster reaped plentiful rewards for the Duke. Bred to the Macaroni daughter, Lily Agnes, Doncaster provided the Duke with One Thousand Guineas victress, FAREWELL. Bred to Rouge Rose, he got Derby champion and later top sire, BEND OR. Other important progeny included SIR REUBEN, a winner of the Prince of Wales Stakes, and CAMBUSMORE, a winner of the St. James Palace Stakes. 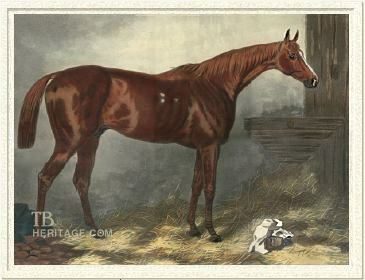 Sandiway Doncaster's son, MUNCASTER proved to be an important link in pedigrees, as he sired Saraband, the broodmare sire of the famed mare, Pretty Polly; Lady Muncaster, the third dam of Bayardo, and Muncaster's daughter, Lady Loverule, produced 1904 Derby winner St. Amant. Doncaster's daughter out of Clemence, by Newminster, a lovely chestnut filly named SANDIWAY, proved a fine filly on the track and as a broodmare. For her breeder, the Duke of Westminster, she won the prestigious Coronation Stakes at Royal Ascot. 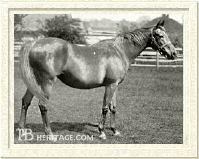 As a broodmare, she produced only three recorded foals, but she has had considerable influence, particularly in American pedigrees. Her daughter, Sandfly, by Isonomy, was exported to the United States. Sandfly's son by Persimmon, Out of Reach, was also exported to America, and came up with a Kentucky Derby winner, 1916 champion George Smith. Sandfly, as a producer, probably made her most important contribution to American breeding as the great-grandam of the stallion Sting. Sting was actually inbred to Sandiway, as both his sire and dam traced to her in the female line. 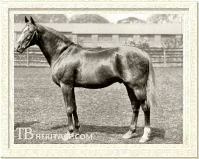 His sire, Spur, claimed Sandiway's daughter Adderly as his second dam. Sting was a very good racehorse, his victories included the Metropolitan and Suburban Handicaps. As a stallion, he founded a sire line that led to the phenomenal American champion, Dr. Fager. American horse Dark Secret, a handicap star in the 1930s, with victories in the Jockey Club Gold Cup, the Brooklyn Handicap, the Saratoga Cup, and several other important races, claimed Sandiway as his fourth dam. Over the years, his son, Bend Or, superseded Doncaster as the premier stallion at Eaton, with such progeny as Ormonde, Orion, Kendal, Laveno, and Ornament. It is recorded that Empress Elisabeth of Austria, on a trip to England, paid a visit to Eaton, and fell in love with the chestnut son of Stockwell, and inquired of the Duke that she would be more than happy to buy him if he were ever to be sold. Eventually Doncaster was sold--Ormonde had just won the Triple Crown, thereby sealing the success of his sire. Doncaster went for £5000 to his admirer, and lived out his days at the Kisber Stud, where he died in 1892. He left his legacy behind in Britain-- his remarkable son Bend Or, the founder of a tremendous male line that to this day, shows no sign of ever weakening.